Texas Hold'em King 3 for BlackBerry | BlackBerry Blast! For those new to poker, “No Limit Texas Hold’em” is a game of skill, cunning and deception. 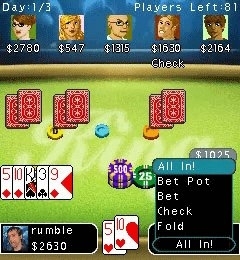 It is by far the most popular poker game in casinos and at homes throughout North America and Europe. This is the game played during the “World Series of Poker” and other major tournaments. Texas Hold’em King 3 is the third edition of Magmic’s “Texas Hold’em King” series, one of the top mobile poker franchises with over 5 million product downloads and a multi-player community of over 100,000.